Current trends in home décor and wedding planning tell us that shabby chic is all the rage. So, this week you can get your fill of rustic yet stylish frames while our Shabby Chic and Rustic collections are on sale. These two distinct lines are the perfect mixture of organic and refined. When we contemplate what this style envelops we think of a mixture of warm and raw, clean and natural, rustic and modern, delicate and aged. Here are some examples to illustrate how you can combine these paradoxes to create some amazing framing treatments. Our Shabby Chic line is made from 100% solid wood and features a strong linear detail with rubbed finishes and slight red tones. They are also deep enough to frame canvas! 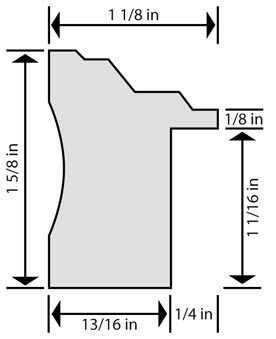 This cross section of the moulding shows the detailing on top and side in addition to the depth (or rabbet) of the frame. Here, we took a colorful and scenic photograph of a mountain and punched it up with a green frame (frame 12408, Shabby Chic -Tartan Green). 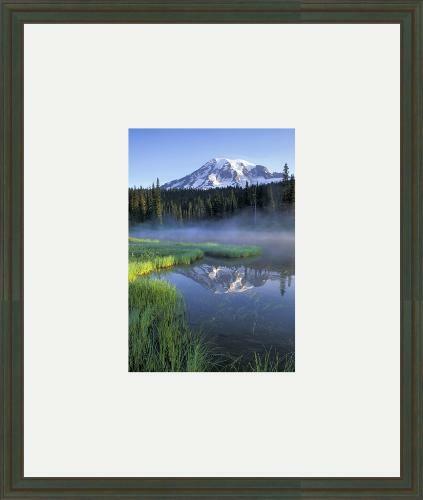 This still works with the rustic chic design aesthetic because the green color of the frame mimics the hues in the photograph and the wide mat borders give it that perfected look. 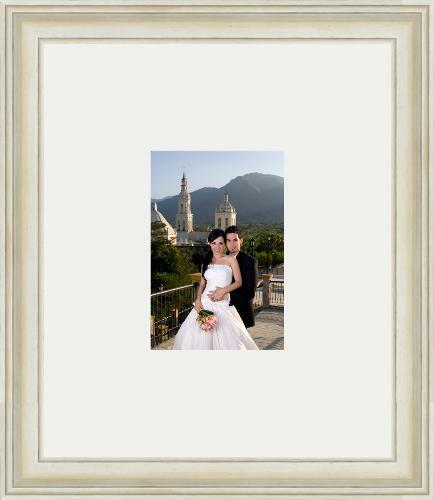 Another popular yet unexpected way to use these mouldings is to frame wedding photographs. Here, we framed two wedding photos with our Shabby Chic collection. 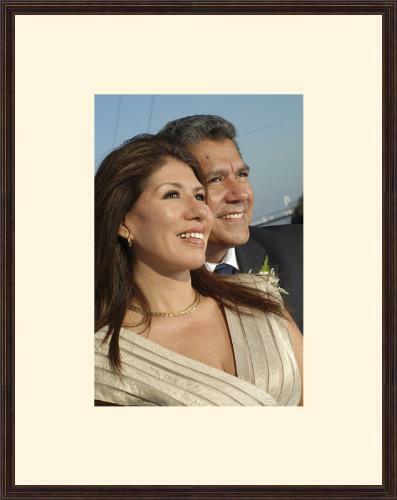 These frames, with their rubbed antique finish and strong profile, give these photographs a gentle but sophisticated look. We added wider mat board borders to make the frames even more classy and polished. We kept this photo neutral and mellow with a cream mat and a brown frame (frame 12403, Shabby Chic- Tuscan Brown). 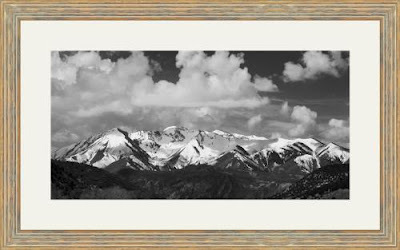 This photograph is framed with a crisp white mat and frame 12596, Shabby Chic- French White. We incorporated wide borders to give it that luxurious, gallery look. We can imagine this hanging on a white-washed paneled wall or in a room with muted tones. On the other hand, our Rustics selection is reminiscent of old, weathered barn wood. 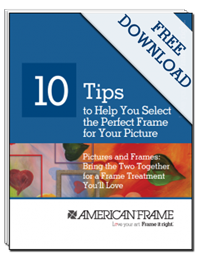 These frames are also 100% wood and feature traditional barn-wood tones. These mouldings are excellent for framing organic, outdoorsy images and artwork. 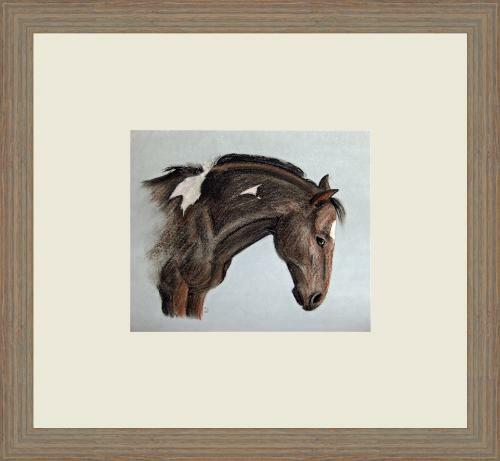 This drawing is framed with moulding 812101, Weathered Brown. We kept it charming, subtle, and accentuated the natural tones by using an off-white mat and a rustic barn-wood finish frame. 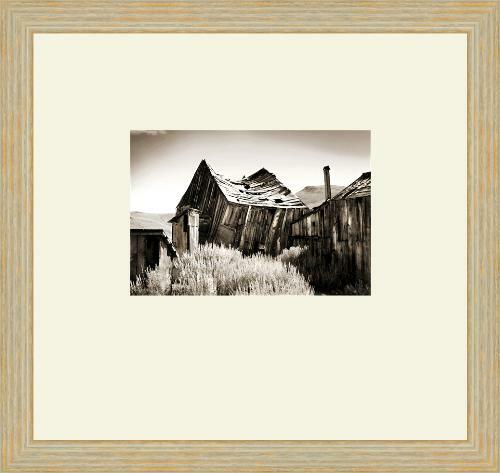 This photograph is framed with 812102, Rustics- Weathered Natural and an elegant white mat. We chose frame 812103, Rustics- Weathered Grey for this photograph because of its weathered look and natural tone and finish. Another way to accomplish a sharp look with these frames is to play with the proportions of the mat board borders. In the last two examples, we bottom weighted the mat by 2 or 3 additional inches. You can get away with doing this because the frames are so nondescript; you can almost treat them as if they were metal frames! As depicted, with these two assortments it is easy and effortless to turn beautiful photographs and artwork into something completely unpredictable. What is your take on the rustic chic aesthetic? Have you decorated a part of your house with this look? Have you recently purchased a piece of furniture that is deemed “rustic chic”?